Among the most familiar of the heliozoa, sun animalcules, are members of the family Actinophryidae. This group comprises two genera: Actinophrys and Actinosphaerium. 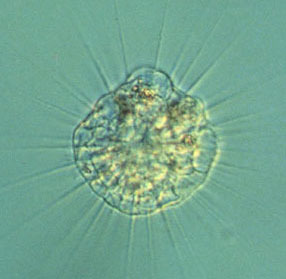 In common with other heliozoa, Actinophrys possesses a spherical shape and radiating pseudopodia called axopodia (sing. axopodium). 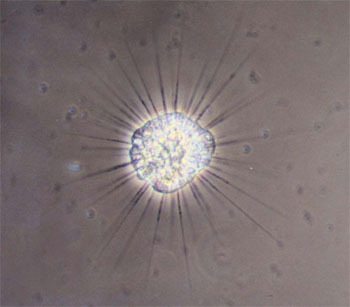 As a result of the globular form and numerous tapering pseudopodia, this organism looks like a minute sun under the microscope, especially when using the phase contrast technique (Figure 1). This protozoon has one nucleus located in the cell center. Its many false feet are attached by their bases to the nuclear membrane surface and protrude to the outside. These pseudopodia are supported by axial rods (microtubular axonemes). Its axopodia have a number of indistinct extrusomes; these are special organellae for capturing or killing prey and for protection from its predators, which flow along its arms. An Actinophrys has no internal skeleton, cilia or flagella. A whole cell is highly vacuolated especially in the peripheral area (Figure 2). Generally, the cell body is approximately 40-50 microns in diameter and some vary from 30-90 microns. Like other sarcodines, or amoebae, the major reproduction in Actinophrys takes place asexually by binary fission, a division into two similarly equal parts (Figure 3). 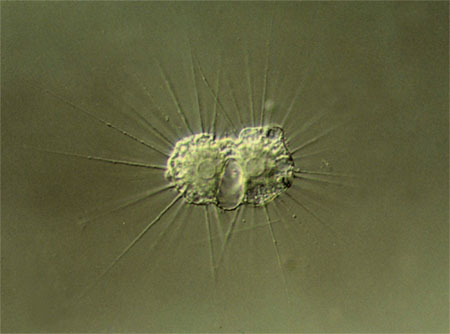 However actinophryid heliozoa have a different sexual reproduction called autogamy which does not occur in other groups. In brief, an individual of Actinophrys undergoes encystment and divides into two diploid cells called gamonts within the cyst case. Then each gamont carries on two meiotic divisions but one nucleus of each division becomes pycnotic and degenerated. Two haploid isogametes, morphologically identical gametes, are produced by this process. Afterwards, the fusion of amoeboid gametes and nuclei happens to produce a zygote located within a cyst. When the environment is suitable, this new microorganism excysts and seeks its food. Please read Protozoology (Grell, 1973) for more information about autogamy and other details. This animal-like protist displays a role of passive predator feeding on small flagellates, diminutive ciliates, microscopic algae, etc. which attach to its axopodia (Figure 4). Although this microbe lacks locomotory structures like cilia and flagella, it can move slowly by motion of stiff axopodia or by floating along in the water current. The sun-like organism occupies various aquatic habitats, such as pool, pond, marsh, lake, etc. 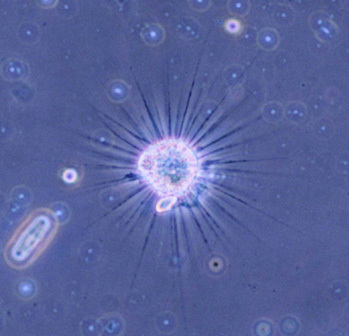 A common and well-known freshwater species of this genus is Actinophrys sol Ehrenberg, 1830. All comments to the author Comments to the author sent via our contacts page quoting page url plus : ('cchantangsi','')">Chitchai Chantangsi are welcomed. I am particularly indebted to Assistant Professor Dr. Orawan Sattayalai for her kind permission to use a microscope and would love to express gratitude to Professor Dr. David J. Patterson for his kind explanation of autogamy. Published in the February 2002 edition of Micscape Magazine.